So I admit I hadn't really read many graphic novels at all before this past month, but I was completely sucked into this unique genre. I felt really slumpy this month when it came to reading, I was just having a hard time focusing on anything and ended up watching way more TV than I usually do, but graphic novels were the perfect thing for my mood. I often need to switch genres when I feel like I'm in a reading slump, or I need to pick up something short that I can finish in an evening, and graphic novels fully delivered on both counts. First off, I can read one of these in about an hour tops, and secondly, they are such a different reading experience from traditional novels. The visual base makes them feel almost cinematic, and much of the nuance in the story is portrayed through the drawings rather than descriptions, so you get a lot of information at a glance. It's just a very different way of processing story from regular novels or from tv, and I loved it! I was shocked at how much poignance and humor and emotion got packed into these, honestly. I can't pretend to have a sophisticated palate when it comes to graphic novels, but I can tell you a little about why I liked or didn't like the ones that I read this past month. 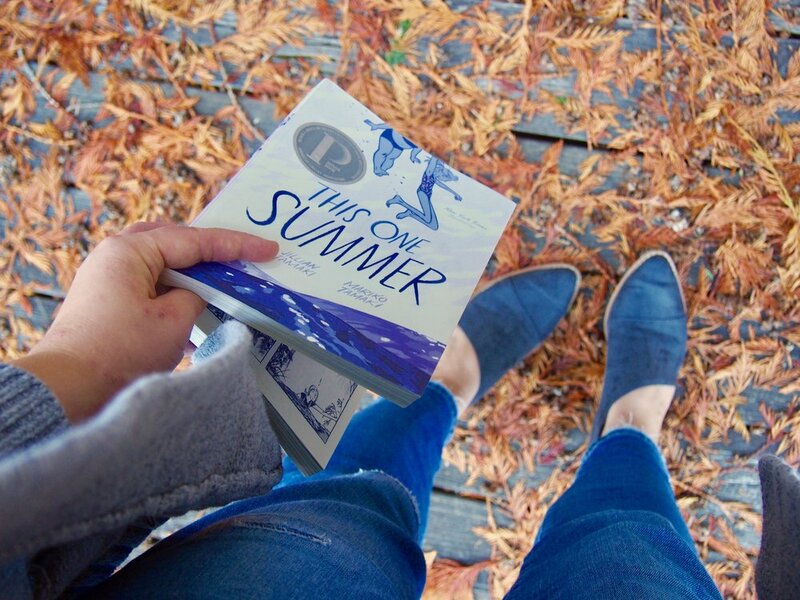 This One Summer | Mariko Tamaki- Man am I glad I picked this up, I really really really loved this one. It captured so many complex and hard to define emotions just perfectly and was absolutely beautifully executed. I especially loved how memory was handled through illustration. Drama | Raina Telgemeier- THIS WAS SO CUTE! It conjured up all the good feels about being a young teen and depicted a group of friends trying to figure out dynamics and love interests all set against the backdrop of them putting on the school play. While I would have liked it to be a little more fleshed out, it was just too cute and warm and fuzzy to resist. I feel like so much of YA wants to be epic, and edgy, and extra, and this one was just so delightfully normal. Ghosts | Raina Telgemeier- I didn't enjoy this one quite as much as Drama, but it was still so cute and fun. I liked the fantastical edge to it and the story was fresh. Telgemeier clearly excels at warm fuzzy novels that have some depth to them. Skim | Mariko Tamaki- I didn't love this one as much as This One Summer....it lacked the same emotional depth and poignancy, but it was still a layered story with a lot going on. Reading Skim's point of view is intentionally a little painful, and I felt like a few of the plot lines were left a bit too open ended, but the art was lovely. Americus | M.K. Reed- Such an interesting look at why books get banned, and the interweaving of the book in question was really well done. I enjoyed the insight of this novel, but I didn't like the artwork as much as some others. Through the Woods | Emily Carroll- Seasonally on point, and filled with original, creepy stories, it was a lot of fun. What stood out the most to be was the artwork, it was so stylized and beautiful. I really enjoyed this as an October read! Daytripper | Fabio Moon + Gabriel Bá- Easily the most gorgeous of the graphic novels I read this month, and the most profound. It's hard to describe without ruining it, but it's a look at a life, and what-if's, and the myriad paths that we take or don't take. I loved loved loved this one. The Encyclopedia of Early Earth | Isabel Greenberg- I'm still finishing this one up, but it is such an interesting and unique premise. It's a lot of smaller stories wrapped up in a bigger ones, about inhabitants of early earth. Lovers who can't touch, lots of mythology and biblical references, muted colors, and cosmic games abound. It's also been surprisingly funny! Anya's Ghost | Vera Brosgol- Again with the seasonally appropriate theme. Anya is a great main character and her ghost/mystery/hilarity is pretty perfectly blended. This one was a great fun read. Do you guys have any suggestions on what graphic novels I should look into next? I'm on the hunt for more good ones and would love to hear!